It was 2 Oct 1629, Dutchman Jeronimus Cornelisz was noosed along with 15 other men by the Dutch East Indies Company for a reign of terror that included mutiny and murder off the coast of Australia. * Six others would eventually hang in the infamous affair, two marooned on the Australian mainland, and many more punished for the gruesome atrocities committed on the Southern Ocean. Cornelisz was not such an assuming character when he boarded the vessel Batavia in 1628. This definitive history of the Batavia mutiny is by one of the web’s best history bloggers, Mike Dash. He reprinted an interview largely about this book here. Rather, he was a marginally failed merchant, someone who could buy his way on board as an under-merchant** and sail to the southern seas for the prospect of a new life. It has been speculated (here, for instance) that his move to Indonesia was motivated by a desire to put oceanic distances between himself — an apothecary who couldn’t make it in Haarlem — and prosecutors pursuing Anabaptists and other heretics. It didn’t help, either, that his infant child had recently died of the disgracing condition of syphilis. All that is enough to send a man to Indonesia, apparently. Though Cornelisz was not a successful businessman, he was an energetic protagonist from his own station in life and could, eventually, win over any suggestible person with his intelligence and wit. It didn’t take long to do just that to the ship’s skipper, Ariaen Jacobsz — who already held a grudge against the Batavia‘s upper-merchant (and fleet commander), Francisco Pelsaert. In due time their thoughts turned to the ship’s valuable cargo — silver and trade goods headed for the Mughal Empire. As night follows day, the next thoughts turned to mutiny. Cornelisz pulled in people from each of the major groups onboard† to help with his mutiny without attracting the attention of the Pelsaert. All the plot needed was a kickstart to turn enough people against the commander. In the part where the villain reveals his plot, Cornelisz’s goes like this: A group of hooded mutineers assaults the mostly widely lusted-after woman among the socialite passengers, Lucretia (Creesje) Jans; once the assault is reported, the commander must respond; but if the assailants are well-hidden, he must make an example arbitrarily, which pushes his men towards mutiny. And, like a movie villain’s evil plot, Cornelisz’s didn’t come off. The captain punished nobody for the assault, as Creesje could not identify the assailants. The shipboard mutiny withered on the vine. But lucky for Cornelisz, the captain had no inkling that the ship’s under-merchant was involved — though he was pretty sure the skipper and boatswain had something to do with it. In the midst of those days of planned insurrection, the Batavia hit a slightly larger speed bump. On June 4, the vessel ran aground on Morning Reef. There were few casualties from the initial crash, and the remainder escaped in groups, crammed onto small coral islands in the remote but plausibly survivable Houtman Abrolhos chain off the west coast of Australia. The ship’s complement was eventually transferred to Beacon Island and Traitors Island — with limited water (but plenty of silver! ), it was clear to Pelsaert there would be few people left if they didn’t get some help. Off went the captain with 47 crew and passengers in a longboat, leaving more than 250 behind to fend for themselves on the isles. Two months later, Pelsaert found himself in the colonial city Batavia (today, the Indonesian capital Jakarta) appealing to the local authorities at the Dutch East Indies Company for a ship to rescue his stranded crew and passengers. He was quickly given the Sardam — another vessel in his fleet — with a skeleton crew to pick up the passengers (oh, and all that silver). But he wasn’t going to need all those passenger quarters. Cornelisz, as under-merchant, had technical rank in the emergency, and he had taken over the situation at the islands when the commander left. The refugee pharmacist reveled in the power, certainly amplified by the dozen chests of treasure the Batavia carried. So here’s your motivation: a fortune in booty and the South Seas as your playground. This is the stuff of rum wishes and buccaneer dreams. And Lord of the Flies nightmares. Sensing the the time was ripe to lighten the group’s victual needs, Cornelisz‡ sent 15 men to search a larger island visible to the west for water. This journey, Cornelisz was convinced, would be fruitless, so any possible power rivals he could find went off. As well, Cornelisz shipped a larger group to Long Island to get more space. And then began the killing. 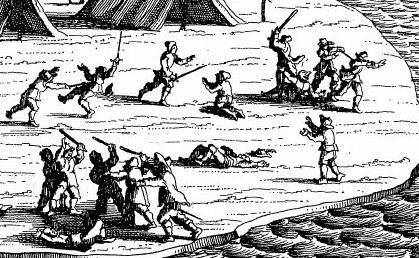 Detail view (click for the full image) of a 1647 engraving of the carnage on Beacon Island. Cornelisz had a good 110 homicides on his soul’s account by the time it was all said and done. Some 20 mutineers formed a tight inner circle with fantasies of having their way on the island until the rescue boat could be commandeered for piracy. The purpose of the killings was simply to knock the number of residents down closer to 40 or 45 so that the mutineers would be overwhelmingly dominant when the rescue boat came. That’s a tough task when starting with almost 200 people. At first, killings proceeded under faux-juridical cover: theft and slander were enough to endanger everyone in these cramped quarters, so Cornelisz would have his men claim illegal activities were afoot and kill one or more of the people he considered either threats or non-entities among the group. A few loyal footsoldiers did most of the killing, along with some pressed into service with the threat of violence; pretty soon the numbers on the island had dwindled noticeably. With vague ideas of riches and a growing bloodlust, killing essentially became sport. Families were done to death wholesale, by whatever means were available — drowning, slitting throats, bludgeoning. Those liable to fight back might be jumped by a group at the beach, sometimes getting all of the above. And before you go thinking murder was the only thing the mutineers had on their minds, they retained at least a few women (including Creesje) as private consorts. Now is the time to mention that Cornelisz was personally acquainted with notorious (and then-imprisoned) degenerate artist Johannes van der Beeck. 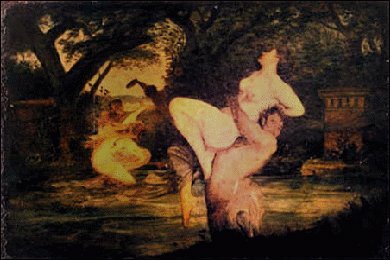 This is van der Beeck’s Faun and Nymphs. But remember those doomed guys searching for water two islands over? Turns out they found it, along with ample food, and they were now occupying the largest island in the chain. They, along with 30 or so who escaped Cornelisz’s clutches over the course of two months, were the Resistance, and they were full of incriminating knowledge about what had been going down over on psycho isle. One of the original group, Wiebbe Hayes, had taken charge of the island’s affairs, and he had done quite well. Those living on what is now known as West Wallabi Island were far better off than their Beacon counterparts. Back on Beacon, Cornelisz was forced to ration water — even to his favorites — and had thoughts that the High Islanders might scupper his search party takeover plot. So late in July, he sent an amphibious landing team to attack High Island. Cornelisz’s men were met with a line of opposition at the beach, armed with pikes made of driftwood with nails. The mutineers retreated. Weeks later, Assault II began; like most sequels, it fell on its face. Assault III, Cornelisz decided, should include cunning, cunning like an ostensible negotiation to trade the clothing Cornelisz had hoarded for water and food. Knowing that having mutineers on his island would be trouble, Hayes convened his council, which swiftly decided to dispatch any prisoner not named Jeronimus: that one was tossed in a pit and given birds to pluck for Hayes’ army. Two weeks went by before the mutineers (now led by Loos) got up the courage to attack again, but by the time they took to the channels and began a long-range gun assault, the Sardam was in the archipelago. Hayes got to Pelsaert first and informed him of the planned mutiny. Pelsaert trained all his weapons on the mutineers’ boat until they decided to disarm. The trials were done in the Dutch way, including some amount of torture. Pelsaert finally decided he had enough evidence against the mutineers, and his small tribunal passed 16 death sentences. (One was commuted to exile.) That included a half dozen who had one or more hands lopped off before their passage to the gallows. 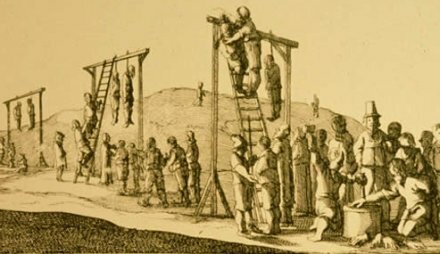 Detail view (click for the full image) of the mutineers’ execution. Three weeks later, when the Sardam returned to Batavia, five more of the rescued mutineers were executed, and a sixth — the boatswain involved in the assault on Creesje — was put to death while Pelsaert was out. Once word got out, Cornelisz’s heinous crimes were known around the world and Southern sailors heard the tales for hundreds of years to come. Pelsaert, meanwhile, was partly blamed for the incident and saw the Company seize his assets: he was dead within a year. As for Hayes, he was promoted, but his further adventures are unknown. 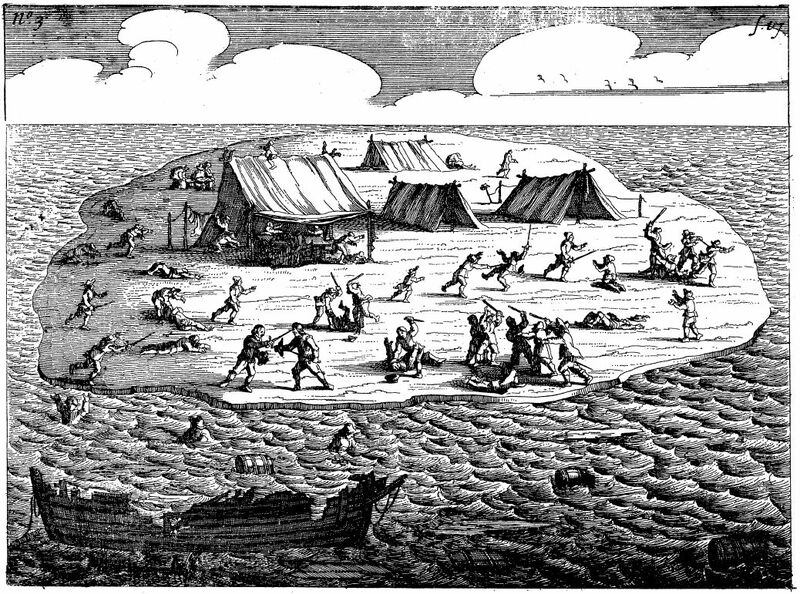 The remains of the shipwreck that commenced this hecatomb are still visible at Houtman Abrolhos, from cannons off the original Batavia to the fort built by Wiebbe Hayes and his men — everyday monuments to a hellish ordeal. * Technically the first European settlers in Australia. ** Dutch merchant vessels were headed by an upper-merchant, who had control over decisions on the ship and represented the overriding interest of the Dutch United East India Company. In addition, an under-merchant was taken aboard as his second-in-command Company man. The skipper was considered head of the crew and placed in charge of navigational concerns, but his role was subordinate to the upper-merchant. and merchants and passengers, who had social standing over the rest. ‡ Technically, Cornelisz was part of a three-member council in charge of the shipwrecked. The initial council was selected from among the socially significant survivors, but Cornelisz used his rank to quickly dissolve that group and appoint two of his own future mutineers as his cohorts. Needless to say, the judiciary wasn’t independent after that.